Great brand new NOS pouch. Perfect new condition yet they are 73 years old! In beautiful, unissued condition. A bargain ad the price. Perfect. They look as new. perfect for 38 special ammo. Good communication, exactly as described. These pouches are original, but they look as if they were brand new. No faded colours or signs of bad storage. I strongly recommend buying them while they're still in stock! Look like brand new; the stamps are clear and I'm quite pleased. 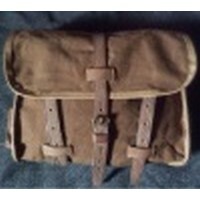 I was very happy with both the leather reproduction pouch and the canvas original. They will get a lot of use like my previous ones. I know they will last, the quality being excellent. Like new and came very quickly! I'm very pleased. quick service and brand new old pouch! Very quick delivery. The item is exactly as described and in "new" condition, despite being as old as myself!